How many times did my mother or I grab a canning jar to fill with beautiful blooms from our yard? No one ever noticed the utilitarian jar under the weight of the gorgeous blossoms, the fruit of our labors in the garden. This card is reminiscent of those days. There was no ink used in the making of this card but I did use Stickles and Glossy Accents from Ranger and a little corner embellishment from Wild Orchid Crafts. 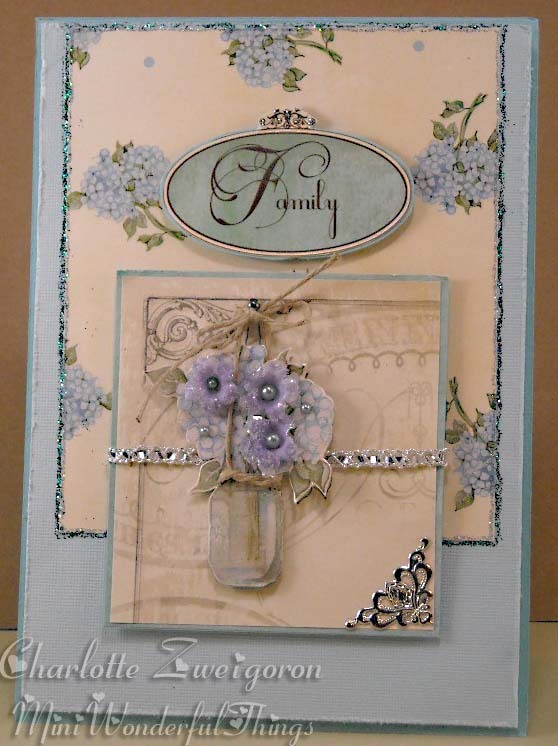 The string and the silver ribbon are from my stash and I made the flowers… sort of. I purchased some silk hydrangea from the floral department and pulled the tiny mini-blossoms off. As I watched TV one night, I painted the edges with glue and dipped them in Diamond Dust. Then, I added some Joann’s dollar bin pearls to the centers. Wow! Is it late! I’d better get this entered right away. Let me hear from you… you know I love it! Deborah! How nice to hear from you! Thank you for sticking with me; I appreciate you taking the time to send me and my cards a little love! Lovely compliment! Sounds like work to me…. I love, love, love it. So sentimental. How do you keep coming up with these winners? Ann, there is so much inspiration in the form of fellow crafters on line that there are hardly enough hours in the day to do what I want to do! Why, Susan, you sweetie!! Thanks for the unreserved compliment! What a lovely card. The hydrangeas look so pretty with the glossy finish. Such pretty papers!